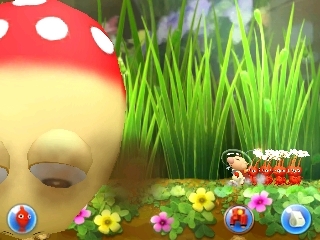 If you’re running low on Pikmin, go find yourself a Pellet! Speaking of how the game plays, movement is handled with the joystick or D-pad while everything else is handled with the stylus. 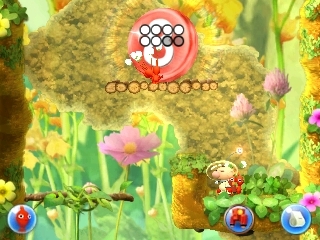 On the lower right bottom screen are two icons, a jetpack and a whistle. By tapping either, you’ll activate the corresponding effect (yes, that does mean you have to use your stylus to jump, which takes some getting accustomed to). 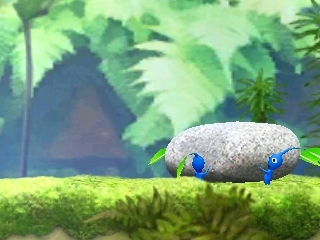 Once you snag a group of Pikmin (they hide in groups of four), an icon for that group will appear to the lower left. 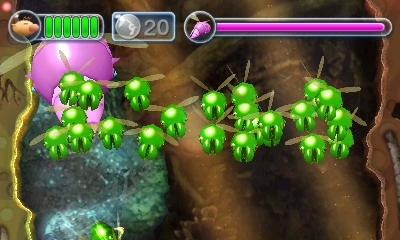 Thus equipped, tapping anywhere on the screen will hurl your Pikmin in that direction, though keep in mind each breed has a different trajectory and weight, as well as differing amounts of damage they inflict on foes (while most are killed with one hit, the larger ones take some effort to bring down). 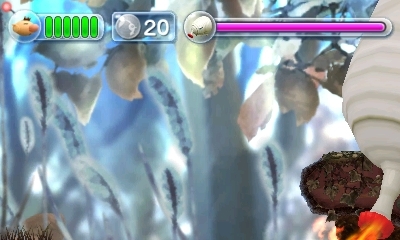 If you have two different breeds of Pikmin, tapping on their icon will switch which one you’re going to throw first, which is important. After all, only Rock Pikmin shatter crystal barriers, and only Yellow Pikmin can safely navigate electrified surfaces (one great area even has you use them to complete electrical circuits, which force luminescent flower platforms to bloom). Truly, a treasure for the ages! As for your goal, the point of each area is to collect as much Sparklium as possible. While most of what you harvest is only worth one point, or five for large orange Sparklium, the way to gather a bunch of it is by finding treasures. These artifacts are everyday devices that loom larger than life for Olimar and his minions and can give you anywhere from 100 to 1000 Sparklium. Some examples of treasures are wedding rings, detached toy robot legs, classic video game cartridges and much more. Best of all, some of the treasures are hidden quite well, and I only found around 75% of them in my time with the game. Additionally, as you reach certain milestones in collecting Sparklium, you’ll increase your jetpack efficiency and get more health for Captain Olimar. If you love replay value, the incentive to 100% the game by finding all the treasures is pretty strong. 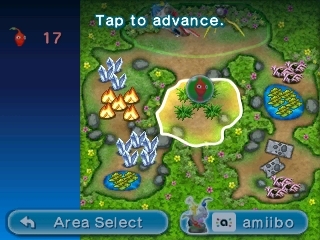 Another more challenging goal is beating all the areas without losing any Pikmin, which earns you a golden Pikmin icon. I managed to beat probably 5 out of the 20+ stages with that distinction, if that tells you anything. The icons tell you which Pikmin can harvest in each section of the park. 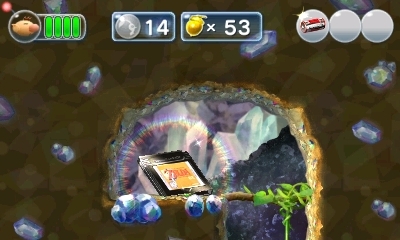 Other than collecting Sparklium in sectors, you can also farm it in a minigame called Pikmin Park. Here you take any Pikmin you kept with you at the end of a stage and put them to work. A touch of your stylus sends them to small habitats and after a period of time, they will have found something, either a small cache of Sparklium or even a treasure. 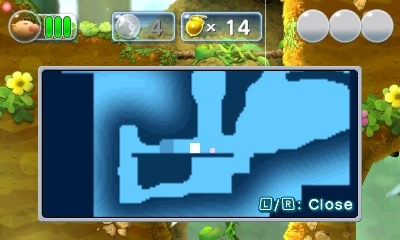 Hazards found in the habitat can only be mined by the proper sort of Pikmin (the same rules apply here as in regular stages) and once you’ve farmed it fully you will open up new sections to mine. Perhaps the most exciting portions of the game are the massive boss fights. Much like in Chibi-Robo! Zip Lash, each of the bosses here are distinct, challenging and fun. The only downside is that many of the bosses are a piece of cake once you find their weak spot. 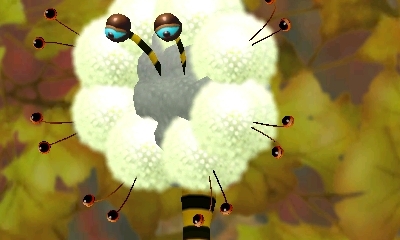 Luckily, the bosses found in the second half of the game are much better, with challenging and crazy attack patterns. One of my favorites was the battle against the Queen Shearwig. You go into the fight armed with Winged Pikmin, meaning you spend the entire fight floating on the bottom screen while the Queen stays on the top, defended by her drones. The whole thing plays like a vertical shmup, with you flinging Winged Pikmin like little pink bullets to remove her shields, avoiding divebombing drones and the Queen herself when she gets fed up. It’s a surprisingly difficult boss fight, and only one example of the best the game has to offer, with the true best battle belonging to the final boss of the game. Once you collect enough Sparklium, you’ll unlock the radar, which makes finding hidden treasure much easier. Graphically the game is very solid, though perhaps not technically impressive. Visually it’s colorful and vibrant, full of a massive bestiary of strange creatures. I was shocked by the sheer variety of them, as there were very few color swaps and most foes had distinct attack patterns. Another aspect of the visual design that appealed to me was the use of both screens to render very large environments and epic boss battles against towering foes. The only downside is that it made getting screencaps for this game a challenge, since you truly need to see both screens to fully appreciate the scale. My only complaint with regard to graphics is one I rarely level against 3DS games; I wish the game made use of 3D. Usually I could care less, but with the size of the background environments, a little three-dimensional pop would have made them that much more impressive. As for the sound design, the music is simple yet catchy, with lots of low key melodies and ambient nature sounds. What I enjoyed more were the sound effects, mostly the various sounds made by Pikmin, such as their cries, joyous cheers and the like. Overall, I was very pleased with Hey! Pikmin. I kept fearing it would turn out to be a mediocre effort at best or a money grab at worst, but it proved highly enjoyable. Like peeling the layers of an onion, I kept finding more content and extra nuance in my 8+ hour experience. I also appreciated how the logs talking about enemies and treasures painted a more complete picture of our protagonist, Captain Olimar. While he’s totally silent in the game, by the end of it I felt I knew more about him as a captain, a father and a husband. It’s true that Hey! Pikmin might not be for everyone. It’s not a pulse-pounding adventure or an intrigue-rich escapade, but that’s okay. It’s not supposed to be that sort of game. Hey! Pikmin is more like a service animal, meant to help provide a relaxing and comforting experience, not unlike playing a Kirby game. If you enjoy simple, fun and relaxing games or are just a fan of Captain Olimar, you can’t go wrong with this one for $39.99. Arzest and Nintendo have done our spacefaring captain justice on the 3DS.